Smaller golf courses are great for beginners to learn on and in encouraging their recreation. These pitch & putt, par 3 and executive courses can also permit lots of entertainment to less skilled golfers. Except for an occasional round with friends or their family members, better golfers are not fascinated so much by these courses. The holes don’t offer enough challenge or variety to these more skilled players. Wouldn’t it be wonderful if a small golf course could attract a full range of golfers? Almost everyone loves to hit their driver. So, key to accomplishing universal appeal among all golfers is a layout allowing everyone to hit their driver several times during their round. This is done on a Friendly Compact Golf Course. It’s a special kind of a smaller golf course. First, let’s examine why an 18-hole, par 72 course isn’t always the perfect answer for every golfer and every situation. A lot of land is needed for a conventional-sized golf course. Its construction and maintenance can be expensive. For most courses, these costs must mainly be generated from fees that can seem, or are in reality, prohibitively high to many people. The impact on the surrounding environment of using so much land is substantial. To maintain that large an area of turf requires a lot of water for irrigation in addition to other non-renewable resources needed. A round takes four and half to six hours to complete. Today that is more time than many have or want to spend. These realities of a large golf course can restrict both eager golfers and those who would potentially like to join the game or play more often. A Friendly Compact Golf Course is a hybrid of a par 3 course - having a full range of par 3 holes, plus challenging and drivable par 4 holes. On half the holes of this course hitting a driver would be possible, in fact useful. This course has extensive teeing surfaces for a number of sets of markers to fit all kinds of golfers. Based on the typical length of their drives, each golfer will select the tee markers appropriate for them. Below is an example scorecard and centerline diagram illustrating how a Friendly Compact Golf Course can be set up. This smaller golf course can greatly contribute to growing the popularity of the intriguing game of golf. Thus more guys, gals, kids and seniors are given a chance of enjoying the fun of such a healthful outdoor competitive and social sport. Avid golfers could alternately play big traditional courses or they could exclusively play a Friendly Compact Golf Course. The latter even more attractive when their available time, funds or even desire is in short supply. 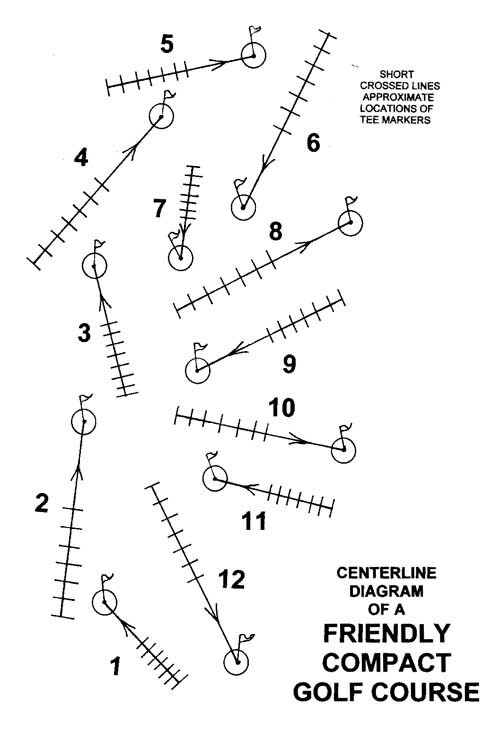 So, here’s a centerline diagram and an example scorecard of a Friendly Compact Golf Course. The routing plan for an actual Friendly Compact Golf Course would depend on a number of individual aspects of your project. These could include the size and shape of the site, contours of the land, the best locations for its support facilities, market for that course, the direction of the prevailing wind, desires of its developer, any practice facilities included and other critical design factors. On a Friendly Compact Golf Course, each golfer selects the tee markers based on the typical length of their drives. 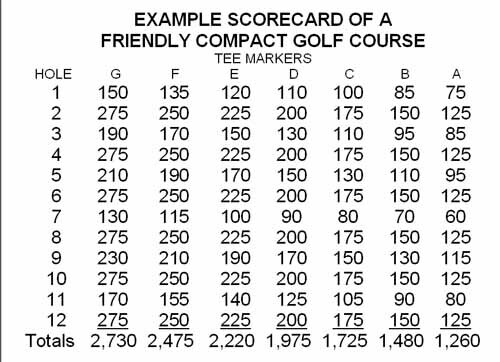 For example if a golfer normally drives approximately 225 yards, on all the holes they should use the “E” markers as shown on the example scorecard above. If long hitting men pros play the course, there could be an additional set of “H” markers to consider their impressive driving length. This type of course fits many situations where you may not have considered one in the past. It can accompany a par 72 course. In populated areas, it can be a stand alone course open to the public. Or one can even be created when an existing golf course must be downsized. It’s not possible for any smaller golf course to have exactly the full range of holes found on a traditional 18. In the same way, a small private airplane isn’t designed to carry as many people as a commercial airliner. Of course, there’s a huge difference in the cost of these two types of planes! If you would like to learn more about a Friendly Compact Golf Course or preparations for any kind of golf course, e-mail your inquiry to Golf Course Architect Bill Amick now at amick@iag.net. You can also phone him now in the US at (386) 767-1449. Bill has been designing all types of golf courses for more then 50 years. His courses are located in more than a dozen states and half a dozen countries. Some of his courses have been used for tournaments on the PGA Tour, the LPGA Tour, the PGA’s Champions Tour and all other levels of competition. He has also served as the president of the American Society of Golf Course Architects.